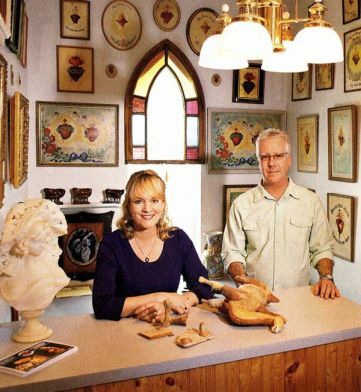 Michelle and William Marhoefer, Master of Fine Arts, School of the Art Institute of Chicago, are Chicago's oldest restoration service specializing in the invisible restoration of ceramic, porcelain, pottery, plaster, stone, metal, and wood art objects. As well as family heirlooms, collectibles and decorative arts. They have restored over 30,000 art objects since 1980. Their clients include art and antique dealers, galleries, collectors, designers, auction houses, and museums--nationwide. They restore valuable and sentimental pieces hence the logo of a broken heart. There are different levels of repair offered from conservation to restoration. Their invisible restoration is guaranteed to satisfy the most discriminating collector. Broken Art Restoration, Inc. has been recommended by Chicago Magazine, Chicago Tribune, Chicago Sun Times, Kankakee Daily Journal, Yes! Magazine, Victoria Magazine, Lake Magazine, and Kovels Fix It Book as well as many antique dealers, collectors, museums, and auction houses. They have been featured on ABC TV News Chicago, CBS TV News Chicago, WGN TV News Chicago, House and Garden TV News and are recommended by Lladro. Free estimates are offered, minimum charge is 50.00. Prices can't be quoted from photos, all objects must be thoroughly examined by Michelle and William Marhoefer. They call the client to discuss options regarding restoration. A fixed price is quoted at this time. A written invoice is provided based on the amount of damage to complete the restoration. No work is done without approval. Our studio is located in Momence Illinois at 12182 E. Metcalf Ave., 60954. Objects must be shipped to this address. Please contact us before shipping. Our drop-off location in Chicago is 1841 W. Chicago Ave. Both locations are available by appointment. Chicago drop off and pick up location: 312.226.8200.